As regular readers know, I’ve been on the lookout for a bubble in seed stage investing. After two years, still no sign. In fact, I’d say that we may be falling somewhat behind. If so, hopefully Right Side (my fund), 500 Startups, and others like us can help plug the gap. To review the history of my seed bubble watch, see here, here, here, and here. Recall that I use the Center for Venture Research’s angel data, the NVCA’s VC data, and my list of “super angel” funds not part of the NVCA. The methodology is not designed to produce the most accurate estimate of the true number of seed-stage dollars. Rather, I want it maximally sensitive to sudden influxes in new seed money. 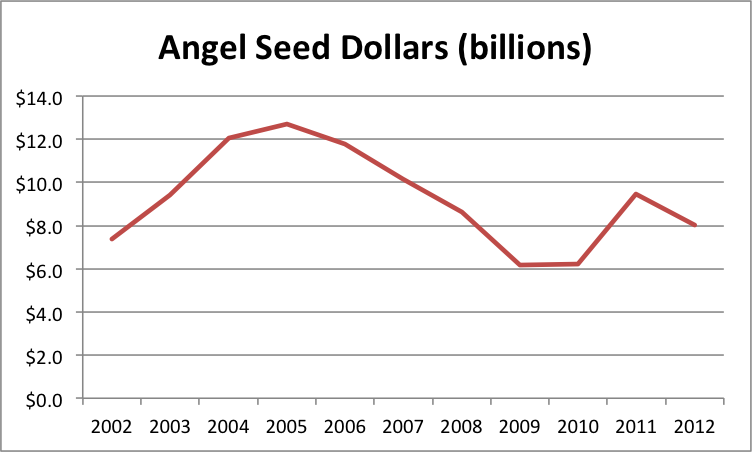 Total seed dollars are down slightly from 2011, driven by surprising weakness from angels and continued erosion from VCs. At least it’s not quite as bad as the data from 1H2012, which was at an $8.7B/yr pace instead of the $9.8B we actually saw for all of 2012. The angel data is interesting. (I have to say that because my prediction of $10B of angel seed for 2012 was wrong.) Total angel investment across all stages was actually up very slightly at 1.8%. But the share deployed at the seed stage dropped pretty dramatically from 42% to 35%. Initially, I was troubled. If angels were pulling away from the seed stage faster than new sources were coming on line, we could actually end up with a seed stage “crunch” rather than a bubble. So I decided to investigate further. I went to the HALO report, a joint product of the Angel Resource Institute (funded by the Kauffman Foundation), Silicon Valley Bank, and CB Insights. This report does not provide an estimate of total angel volume. However, it does track some key statistics of investments by angel groups. According to this source, the mean and median round sizes didn’t change much from 2011 to 2012. Mean up 10%, median down 4%. Pre-money valuations were exactly the same, with a median of $2.5M. So it appears that angel groups are making pretty much the same kinds of investments in 2012 as they did in 2011. My guess is that the difference in angel seed from 2011 to 2012 comes mostly from what angels mentally categorize as “seed” vs “early” in the CVR survey. I’m sure it randomly fluctuates a bit from year to year. But I think most of the explanation is that startups generally appear farther along, thanks to (1) the prevalence of incubators/accelerators (and the diffusion via the Internet of the lessons they learn) and (2) the decreasing time necessary to build products that receive initial market feedback. The ecology is probably innovating faster than angels are adjusting their mental yardsticks of progress. So the share of angel dollars going to the earliest quartile of deals they see may not be changing. It’s just that improvements in infrastructure have allowed these young companies to make more progress before they approach angels. Interestingly, the HALO report shows a drop from 21.0% to 18.1% in California’s share of angel group activity. Apparently, we at Right Side are not the only ones who believe that startups outside of Silicon Valley are a “good value”. Note also that I added a new source for seed fund data. 500 Startups tracks small VC funds here. So I went down the list and eliminated all funds that were duplicates of funds I already track, members of the NVCA so already accounted for in that data, who invest solely outside the US, or whose investment focus is in a stage other than seed. In cases where there were duplicates with my existing data, I used whichever source had the highest fund size.